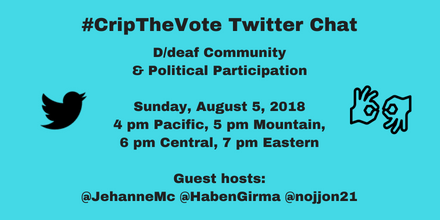 Join #CripTheVote for this discussion about the D/deaf Community & Political Participation with 3 incredible guest hosts: Jehanne McCullough, Haben Girma, and Jonathan Dollhopf. Everyone is welcome to participate but please note that the conversation will be centered on the D/eaf community including anyone that identifies as D/deaf, Deafblind, Deaf Disabled, and Hard of Hearing. Encouraging Deaf Communities to Participate in Political Processes, International Foundation for Electoral Systems, August 19, 2015. Help America Vote Act. US Election Assistance Commission. Voting Accessibility. US Election Assistance Commission. Voting. National Disability Rights Network. Follow @GreggBeratan @AndrewPulrang @DisVisibility @JehanneMc, @HabenGirma, @nojjon21. When it’s time for the chat, search #CripTheVote on Twitter for the series of live tweets under the ‘Latest’ tab for the full conversation. Welcome to the #CripTheVote chat on Political Participation & the D/deaf Community w/ guest hosts @JehanneMc, @HabenGirma, @nojjon21! Everyone is welcome to participate but please note that the conversation will be centered on D/eaf people. 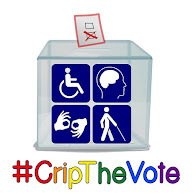 This concludes our #CripTheVote chat on Political Participation & the D/deaf Community. Many thanks to our guest hosts @JehanneMc, @HabenGirma, @nojjon21! Please note: This chat will be 75 minutes instead of 60. Follow @GreggBeratan @AndrewPulrang @DisVisibility @DisabledLatinx. When it’s time for the chat, search #CripTheVote on Twitter for the series of live tweets under the ‘Latest’ tab for the full conversation. 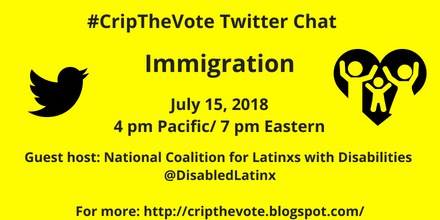 Welcome to the #CripTheVote chat on immigration with guest host @DisabledLatinx! Thank you for joining the #CripTheVote chat on immigration. A big thank you to our guest host @DisabledLatinx for joining us today! Únase a #CripTheVote para este importante debate sobre la inmigración con la “National Coalition for Latinxs with Disabilities” (Coalición Nacional para Latinxs con Discapacidades) su convidador invitado. Discutiremos la separación de la familia, la política de "tolerancia cero" y cómo el Departamento de Seguridad Nacional (DHS) propuso la regla sobre el "cargo público" impactará #DisabledImmigrants. Tenga en cuenta: este chat será de 75 minutos en lugar de 60. Siga @GreggBeratan @AndrewPulrang @DisVisibility @DisabledLatinx. Cuando es el momento para el chat, busca #CripTheVote en Twitter para la serie de tweets en vivo en el tab 'más reciente ' para la conversación completa. Si usted esta abrumado por la cantidad de tweets y sólo quiere ver las preguntas del chat para que pueda responder a ellos, marque la cuenta de @DisVisibility. Las preguntas serán twitteadas 5-6 minutos aparte. 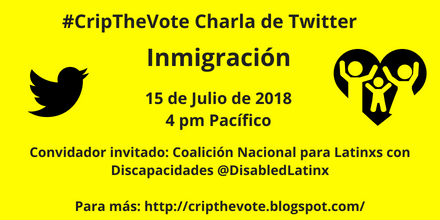 Bienvenido a la #CripTheVote charla sobre inmigración con @DisabledLatinx! su convidador invitado. Recuerda usar el hashtag #CripTheVote cuando Twitteas. Si usted responde a una pregunta como Q1, su Tweet debe seguir este formato: "A1 [su mensaje] #CripTheVote"
Gracias por unirse a la charla #CripTheVote sobre inmigración. Un gran agradecimiento a nuestro anfitrión invitado @DisabledLatinx por unirse con nosotros hoy!